I know I’ve got the category Foodie Friday. And I know I’ve tagged this post in it… But it couldn’t wait. This was just too yummy to keep to myself any longer (I made it two weeks ago). Just because you’re pregnant, doesn’t mean you have to listen to everyone out there who thinks you should be sitting on your couch, doing nothing, and eating bonbons. Gaining 100-pounds in the process. No. Being healthy is the most important part of pregnancy. Eating healthy and staying moving (as long as you can) is key. Not only does it make your pregnancy easier, but it will make labor and your “down time” afterwards a lot easier as well. 99% of the time, I nail it. Then I have to struggle to remember exactly what I did and even a rough idea on just how much of what I put in. It takes me a few hours sometimes to remember remotely enough to make it again. The other night, I saw the cukes and the package of sausage sitting next to each other and the gears began working. The end result was delicious. The other half went back for thirds, so that’s when I know I’ve done something right. I’ve just gotten my “spicy” back in my pregnancy, so I attacked it head on with this recipe. The cukes were perfect because they give you a little bit of crunch, some juiciness and they absorbed the sausages spicy to that “just right” amount. It’s a good one-dish kind of meal (which I clearly love), and it’s NOT packed with a lot of calories, but it’s packed with all of those good things you need for your body and your baby (or babies) need. It’s not heavy, so you won’t feel bloated after. And it’s great reheated for left overs! The question here is: Can you multitask at the stove? This is best done with both portions of the recipe cooking at the same time. 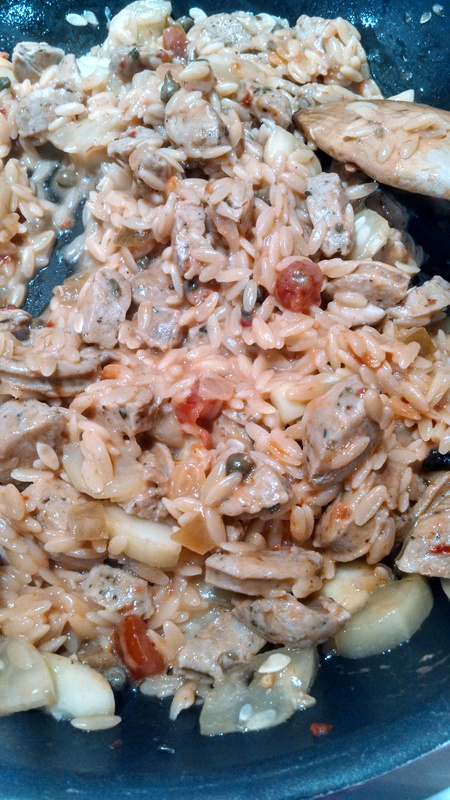 The orzo will be done about the same time it needs to be a added to the sausage. In a large skillet, add olive oil and warm on medium. Add in cucumbers and shittakes. Let cook for 5 minutes. 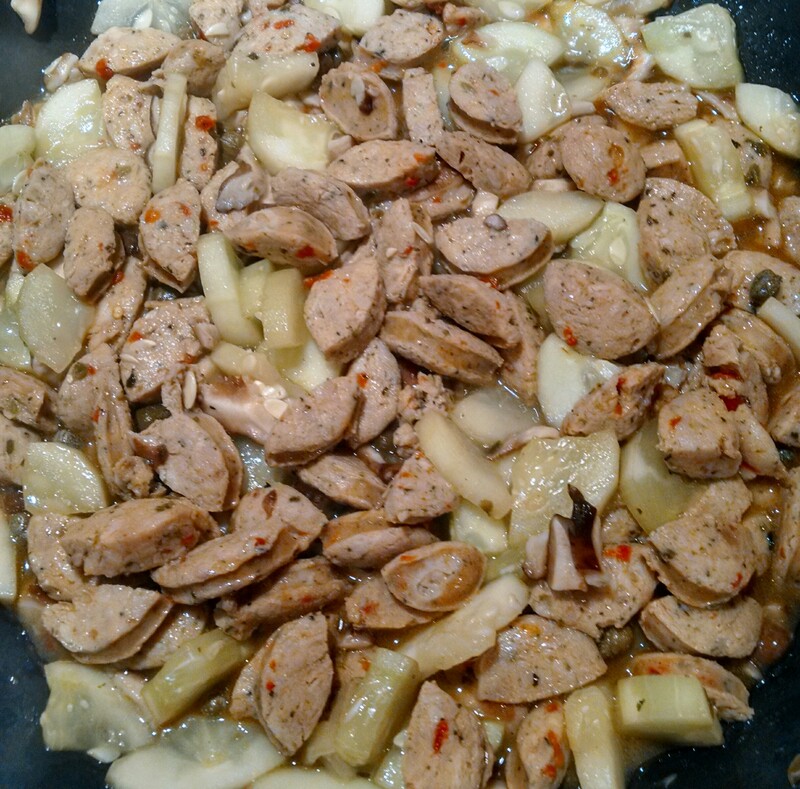 Add in capers and caper juice, then after about 2 minutes, add in sausage. Turning them temp up to medium-high, let cook for about 10 minutes. Stirring occasionally to keep flavors cooking together and blending. Turn down to low. Combine all ingredients into a pot and cook on medium until orzo is cooked. Once done, add to sausage and mix well. Let all contents cook on low for about 5 minutes.